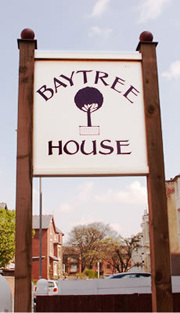 Welcome to Bay Tree House in Southport, a ‘once discovered, never forgotten’ place to stay. A delightful and very individual retreat where the warmth and friendliness of hosts Leigh and Cleo is always apparent. AA 4 Red Diamond. (Red Diamonds are only awarded to the top ten percent of establishments in the country). Six individually furnished bedrooms; two superior front-facing ones with the option of the bed as either superkingsize or twin singles and four classic double rooms with queensize double bed. All rooms have brand-new en-suite facilities all with walk-in shower and one with a freestanding bath too.Wireless broadband internet access in all rooms.Colour TV, DVD player and small DVD Library, bedside telephone, tea & coffee making facilities (including fruit teas, chocolate etc. 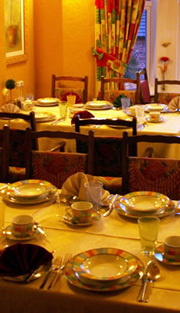 ), hairdryers, well-stocked mini-fridges, iron & ironing board and clock radios as standard in all rooms. 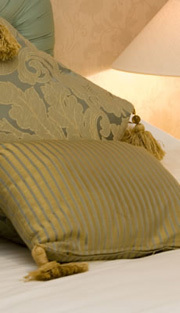 Towelling bath robes, complimentary slippers and a selection of quality toiletries in every guest room. Our AA “Eggcup Award Winning” Hearty Lancashire breakfast is served from 7 o’clock until 9 o’clock through the week and 8 o’clock until 10 o’clock at weekends and Bank Holidays. For Golfing Parties, Conferences and guests who need to make an early start we will always very happily arrange an earlier breakfast. Rooms fully serviced daily & steam cleaned frequently.For guests convenience we have three car-parking spaces available and in addition there are no restrictions on the road outside.We are proud to be strictly non-smoking throughout. Each of our six bedrooms has it’s own charm and individual décor. All have en-suite facilities, Colour TV, DVD player and small DVD Library, bedside telephone, tea & coffee making facilities (including fruit teas, chocolate etc. ), hairdryers, well-stocked mini-fridge, iron, ironing board and clock radio. The Inspector from the AA particularly remarked on how well equipped the accommodation really is. Wireless broadband internet access is available in all rooms. We are well-known for our good food lovingly prepared to order from fresh, and whenever possible, local ingredients and presented to a very high standard. It must be down to the bracing sea air and the rolling countryside as golf has been played in Southport since the Victorian era. Over the years a cluster of top quality courses to suit everyone has evolved and within just half an hour's drive of Bay Tree House there are at least 15 courses - six of championship standard. When you discover that these six are considered to be within the top 100 courses in the world, and that there are many more within an hour's drive, it is little wonder Southport is renowned as "England's Golfing Capital". Golfers yet to discover the Southport experience are missing out on a truly unique choice of championship courses. The world famous Royal Birkdale (venue for the 2008 Golf Open) is a golfer's paradise set alongside Hillside, Formby, Formby Ladies, Hesketh, Southport & Ainsdale, Formby Hall, Southport Old Links and West Lancashire. They each typify links golf at its very best.